Voracious Arachnid - Ability changed to "When an ally is killed, Voracious Arachnid gains +1 base attack. 1SE: Target other ally with cost less than Voracious Arachnid 's current attack is killed." (from "When an ally is killed, Voracious Arachnid gains +1 base attack. 1SE: Target opposing ally with cost less than Voracious Arachnid 's current attack is killed."). Mettle of the Warrior - Ability changed to "Attach to your hero. 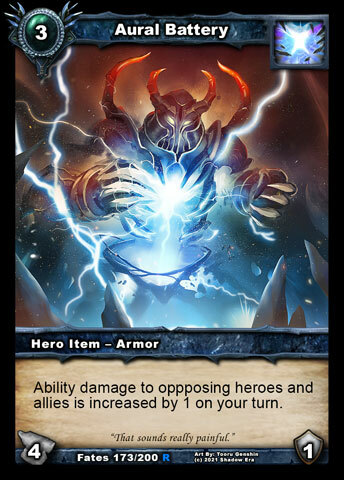 When you summon a weapon, armor, Warrior ally, Warrior item or Warrior support ability, your hero and Warrior allies you control heal 1 damage." (from "Attach to your hero. 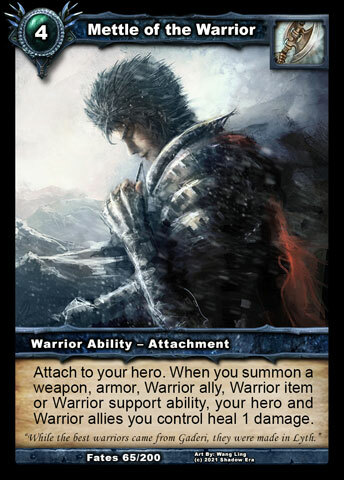 When you summon a Warrior card, your hero and Warrior allies you control heal 1 damage."). Aural Battery - Cost reduced to 3cc (from 4cc). 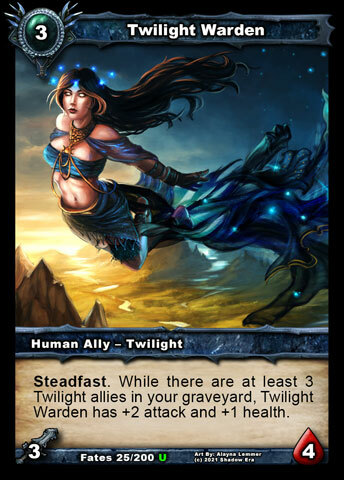 Kallista, Twilight Matriarch - Health increased to 7HP (from 6HP). Armored Packbeast - Attack increased to 1 (from 0). Ability changed to "All damage to Armored Packbeast is reduced by 1. At the end of each of your turns, adjacent heroes and allies heal 1 damage." 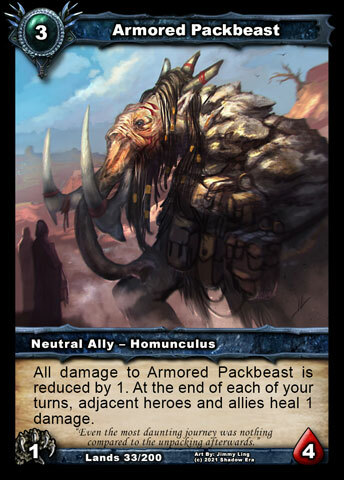 (from "All damage to Armored Packbeast is reduced by 1, and it has +1 attack while damaged. 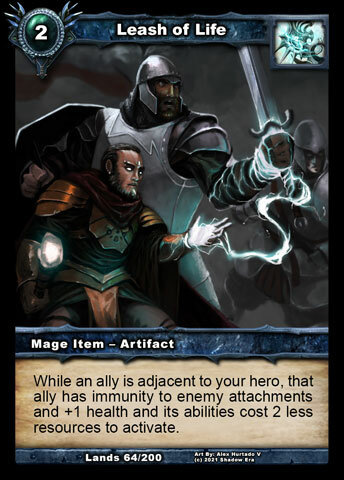 At the end of each of your turns, your hero and other allies heal 1 damage."). 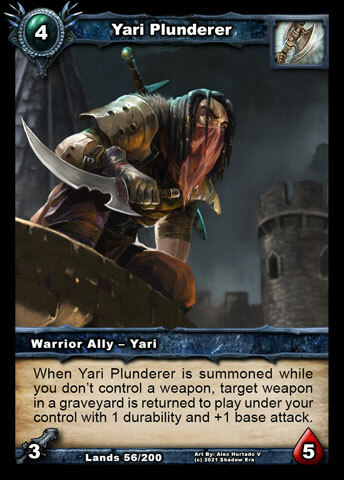 Yari Plunderer - Ability changed to "When Yari Plunderer is summoned while you don't control a weapon, target weapon in a graveyard is returned to play under your control with 1 durability and +1 base attack." (from "When Yari Plunderer is summoned while you don't control a weapon, target weapon in a graveyard is returned to play under your control with 1 durability."). Disarming Personality - Ability changed to "Target weapon with X base attack or armor with X defense becomes a readied ally with X base attack, health equal to its durability and no abilities." (from "Target weapon with X base attack becomes a readied ally with X base attack, health equal to its durability and no abilities."). Leash of Life - Cost reduced to 2cc (from 3cc). Tempest Runebearer - Attack increased to 2 (from 1) Ability changed to "Ability damage to Tempest Runebearer is reduced by 1. While ability damage has been dealt this turn, Tempest Runebearer has +1 attack." 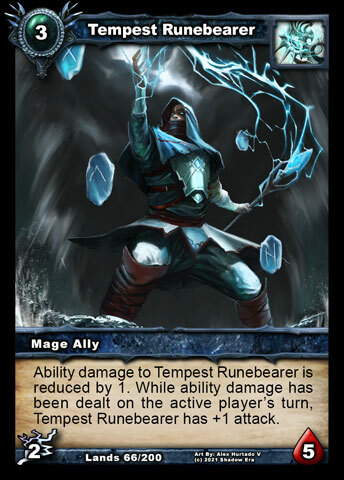 ( from "Ability damage to Tempest Runebearer is reduced by 1. While ability damage has been dealt this turn, Tempest Runebearer has +2 attack."). 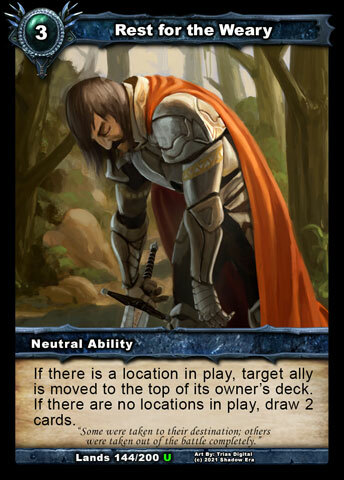 Rest for the Weary - Ability changed to "If there is a location in play, target ally is moved to the top of its owner's deck. If there are no locations in play, draw 2 cards." 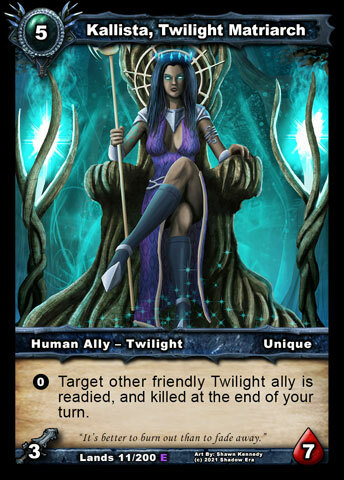 (from "If there is a location in play, target ally is moved to the top of its owner's deck. 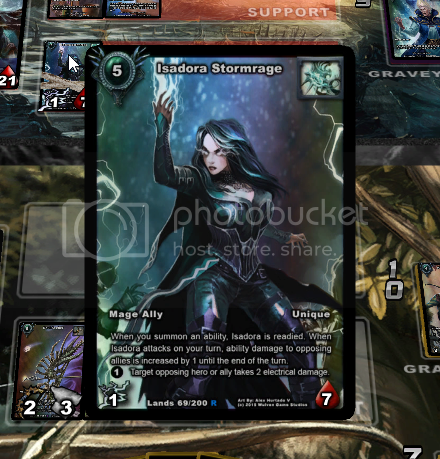 If there are no locations in play, you draw 2 cards and each other player draws 1 card."). Stun Turret - Durability reduced to 2D (from 3D). SE-1140: Rankett's controller ability can be activated after a weapon gained base attack. 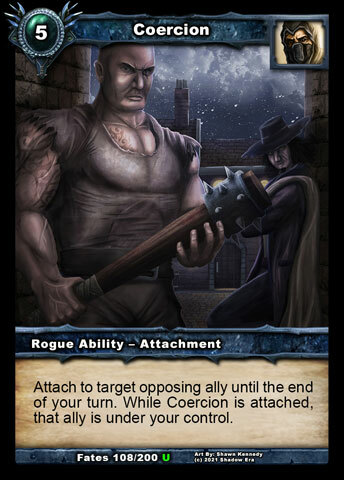 SE-1141: Gwen's ability is still buffing weapon when it is returned from the grave by Yari Plunderer . 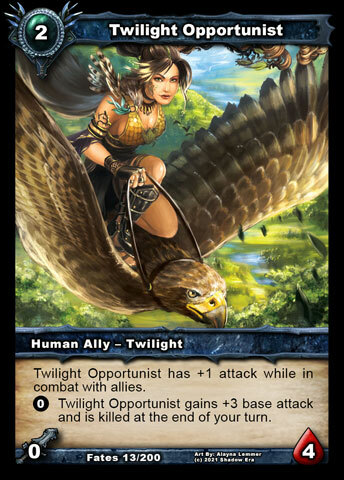 SE-1142: Twilight Opportunist does not have +1 attack when defending against allies. SE-1143: Some Location abilities can be used on allies immune to shadow energy abilities. SE-1145: General of Unaxio and Coercion interact badly in some cases. 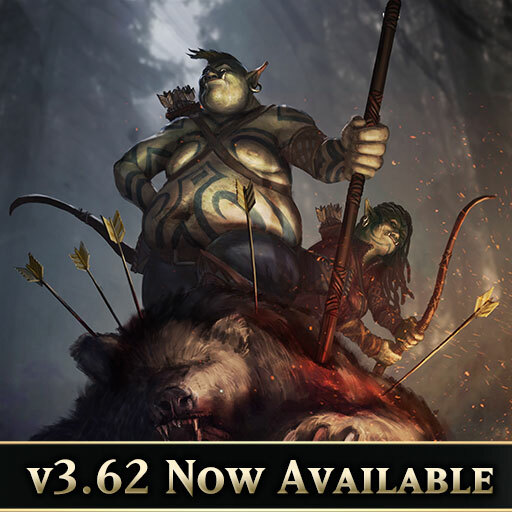 We hope you enjoy the balance changes and special surprises brought by this update. 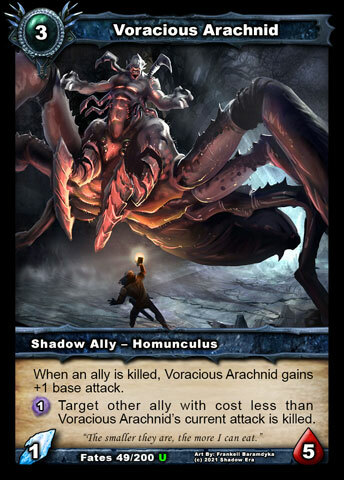 Voracious Arachnid - Ability changed to "When an ally is killed, Voracious Arachnid gains +1 base attack. 1SE: Target other ally with cost less than Voracious Arachnid's current attack is killed." (from "When an ally is killed, Voracious Arachnid gains +1 base attack. 1SE: Target opposing ally with cost less than Voracious Arachnid's current attack is killed."). SE-1141: Gwen's ability is still buffing weapon when it is returned from the grave by Yari Plunderer. I love the Armored Packbeast change in my Zaladar. 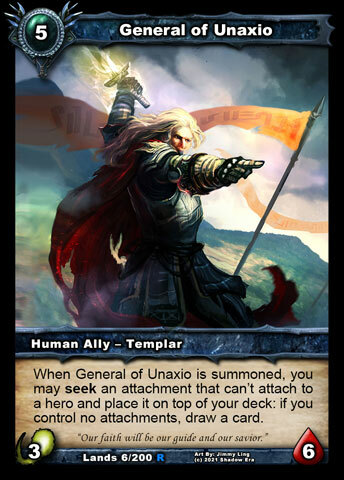 Kallista is now a 5cc 3/7 ally with an ability? 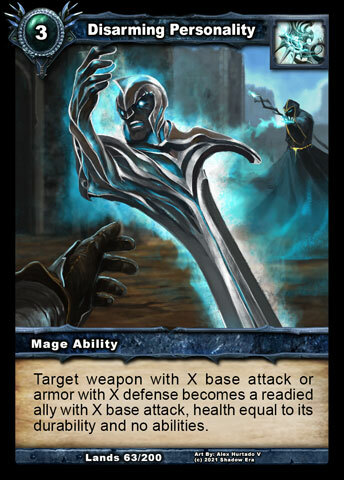 Fairly conditional (tribal) ability I suppose though. And unique. What are the special surprises? I haven't noticed anything. Check recent replays between me and Veles from yesterday. There are some surprises lurking there! Lilyt is SO exciting. 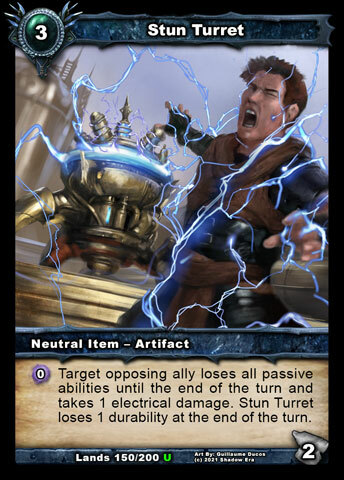 Finally a card that ties that mechanic together a bit.